Last night Geoff and I were casually standing in the pouring rain, happily getting drenched, while friends were standing next to us miserably shivering. This afternoon I drove through drizzle, sun, snow and clear skies all in a single 5 mile stretch from James Street to Lake City. 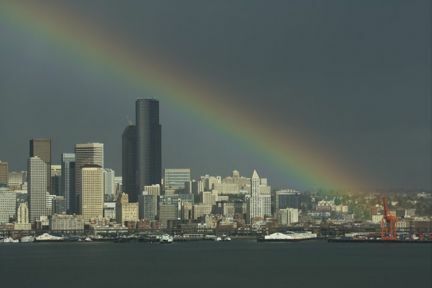 All of which is a very Seattle way of saying, “Welcome to Spring”! I love the Spring & Fall around here because they align with the bipolar orientation of the city itself. There’s a strange dark, shimmering, haunting beauty about Seattle this time of year. In a conversation over lunch today at The Frye, with a much respected artistic influence, I realized this is how I perceive my music as well… dark & pretty… partially cloudy with sun breaks and patches of fog. Nowhere is that more evident than our performances at Vito’s. Talk about bipolar! The room is dark and a bit brooding, but a lot of joy happens in it. Vito’s is a place in which you play to mood of the crowd, not set it for them. It’s an opportunity to be a soundscape behind so much else that’s happening. It’s a chance to be the background of many others’ personal moments, regardless of whether they happen to acknowledge it or not. So as my Fundamental Forces embark on our Spring journey, it’s appropriate we do so in that setting. In fact, there are quite a few opportunities to see us in a variety of setting this season, but more on that later. For now, if you’re so inclined, please join us a Vito’s tomorrow night. This entry was posted in Performances on March 21, 2013 by Sunrise Pixels.